The final tally is in: 11.3 million new jobs were created under President Obama. The president is claiming a big victory on getting Americans back to work again. "Businesses that were bleeding jobs unleashed the longest streak of job creation on record," Obama wrote in a letter to the American people this week. He's right: The economy has added jobs for 75 straight months, although his overall jobs gains aren't as strong as some prior presidents. The U.S. added 15.9 million jobs under President Ronald Reagan and a whopping 22.9 million under President Bill Clinton if you look at how many Americans were employed in the last full month they were in office versus the January when they were sworn in. Obama did outpace President George W. Bush though. 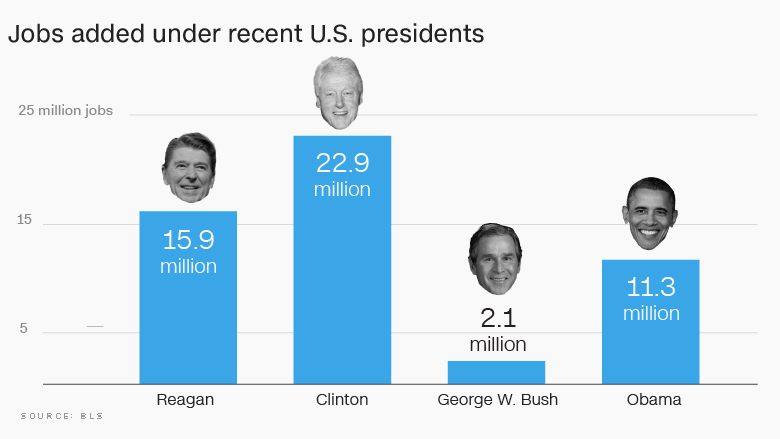 Bush is in the back of the pack among recent presidents who served two terms. 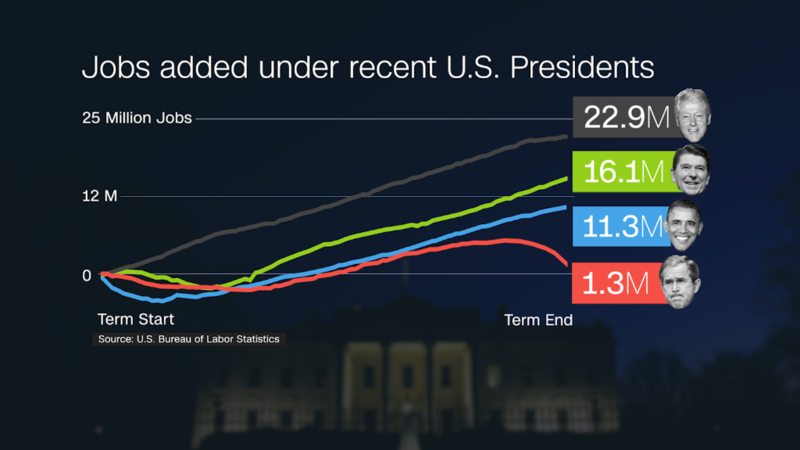 Only 2.1 million jobs were added during Bush's full tenure. Could Obama have done better? His supporters point out that he faced a severe challenge that other presidents did not. "There's a dramatic difference between what Barack Obama was handed and what Donald Trump will be stepping into," says Mark Hamrick, senior economic analyst at Bankrate.com. He took office in January 2009 -- in the depths of the Great Recession -- when the U.S. was bleeding nearly 800,000 jobs a month. It was the worst economic hole America had seen since the Great Depression of the 1930s. Obama himself called it a "moment of peril unlike any we'd seen in decades." Congress and President Obama acted swiftly with a stimulus package that spent big money on roads and other projects and also gave people tax cuts. The goal was to get people back to work. It took awhile to kick in, but businesses finally started adding jobs by the end of 2010. Since then, the gains have accelerated: 2014 and 2015 turned out to be the best years for jobs gains since the late 1990s. The unemployment rate peaked at 10% and is now back down to 4.7% -- a level many consider normal for a healthy economy. "The economy is at full employment. This is it," says Chris Rupkey, chief financial economist at MUFG Union Bank. "The pool is all but drained especially for skilled workers." There is an ongoing debate about how "good" the jobs added were. Almost all of the employment gains under Obama were so-called service jobs. Some of those are high-paying like nursing and tech, but others are low-wage, like retail and restaurant jobs. One economist found that 47% of the jobs created under Obama are in the "high-wage" category. One of Obama's regrets is that he wasn't able to do more to reduce inequality in America. "We have to acknowledge the inequality that has come from an increasingly globalized economy while committing ourselves to making it work better for everyone, not just those at the top," he said in his letter.